MAGIC MOMENT: Leeds United's Carl Shutt, Rod Wallace and Eric Cantona celebrate their side's 3-2 win at Sheffield United on April 26, 1992 which ultimately carried the Whites to the Division One title. It was the “crazy game” that carried Leeds United and Howard Wilkinson to the first division title on a windswept day in Sheffield. United’s 3-2 win at Bramall Lane, the outright winner in a poll of the biggest Leeds match of the 1990s, was the crowning glory of Wilkinson’s managerial reign, earning Leeds the biggest prize in English football. Wilkinson’s squad were a picture of composure for most of a exemplary campaign but the players involved in the victory over Sheffield United on April 26, 1992 remember a chaotic afternoon of own goals, fierce gales and inevitable tension. Chris Whyte, one of United’s centre-backs, admitted he “never played in a more crazy game, before or after” and claimed the narrow win in a match so on-edge and unpredictable was the clearest sign that the title was destined for Elland Road. 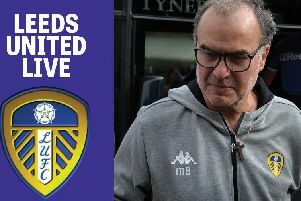 His team-mate Jon Newsome, who scored Leeds’ second goal, had more poignant reasons for cherishing the match, recalling how he and the late Gary Speed celebrated in Sheffield after Manchester United’s defeat to Liverpool later in the day – a result which put the championship beyond doubt. “The greatest day in my footballing career was the day that Leeds won the (Division One) title,” Newsome told the YEP after Speed’s sudden death last November. “After that game at Bramall Lane, Liverpool and Manchester United were playing at Anfield and me and Gary went back to my parents’ house in Sheffield and watched it there. “Liverpool won and we realised there and then that Leeds had won the title. United’s priority at Bramall Lane was understandably result over performance. “With the Championship tucked safely away, who cares if this was not United’s most polished display of the season,” wrote the YEP’s Don Waters. Alan Cork’s 28th-minute tap-in was a routine goal in comparison to three of the four which followed. Rod Wallace equalised unintentionally with a deflection off his hip and Newsome replied to an own goal from Lee Chapman before Brian Gayle misjudged a back-pass from full-back David Barnes and headed the ball into Sheffield United’s net with 13 minutes to play. “In the end we got there with a centimetre to spare but the players thoroughly deserved that success,” Wilkinson said. The clash at Bramall Lane came top of the YEP’s poll with 45 per cent of the vote, ahead of the 1-0 win at Bournemouth which earned Leeds the second division title two years earlier. United’s triumph on the south coast in May 1990 was the staging point for their assault on the first division and Wilkinson exceeded all expectation by making the dream of the top-flight title a reality within four years of becoming manager. Leeds United 1 Rangers 2 (1992) – 0 per cent.